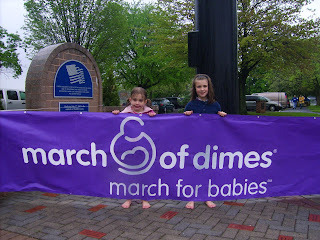 I would like to thank everyone who supported us, and the March of Dimes this weekend. To date we have raised $345 for the March of Dimes, in memory of Baby Todd. THANK YOU!! 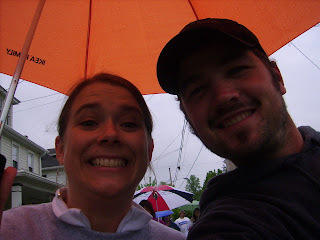 The girls, Dustin & I walked the 5 miles in the rain on Sunday. Despite the rain, we had a great time together. I was very impressed with the girls and their determination to "Finish the Race". Part way into the walk, we decided to give up on the idea of keeping the girls dry. 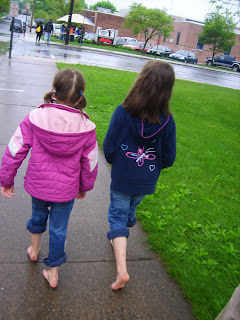 They walked most of the way in their barefeet! I thought of you on Sunday--the right temperature for walking, but holding an unbrellla can get tiring after awhile. Congtatulations to all of you for finishing the race. Your family continues to be a blessing to all who know you! And even those who only know you through your "Baby's Journey Home"
Your story will always have a place in my heart! Your girls are a wonderful testimony as well. what a wonderful family blessing! It's been a while since I've checked your blog, but what an encouragement and blessing you all continue to be to everyone around you! Thank you so very much for continuing to write your story and proclaim Christ in everything. You all are definitely my modern day heroes! Press on faithful servants. Still pray for you all.